My geohistory of Los Angeles begins in 1965, in the bewildering aftermath of one of the most violent and costly riots in U.S. history. The Watts Riots burned down the core of African American LA and had an even larger, worldwide impact. As one of the leading edges of global urban unrest in the 1960s, the Watts uprising announced to the world that the postwar economic boom in the United States and elsewhere was not going to continue with business as usual, for too many benefited too little from the boom. There were riots and uprisings around the world before and after Watts, but none were as violent, as destructive, and perhaps as symbolic of the end of an era and the beginning of a new one as the events of 1965 in Los Angeles. My Los Angeles is in large part an effort to make sense of what happened to LA in the decades following the Watts uprising. Virtually everything contained in My Los Angeles depends on and extends from this first chapter and its central argument that the Watts Riots marked the end of the long postwar economic boom in the United States and signaled the onset of a period of crisis-generated economic restructuring that would affect to some degree every major metropolis in the industrialized world.The argument goes one step further to claim and demonstrate that very few if any other metropolitan areas in the world were as deeply restructured and radically changed as Los Angeles, giving to those who study it a remarkable panorama of experiences and expressions from which to draw insight. There is some historical sequencing to this look at the urban restructuring of Los Angeles, but what emerges is certainly not a comprehensive history of LA before or after 1965. Nor is the geography of Los Angeles presented in full and permanent detail. To keep the historical and the geographical developing together, I call what I do "geohistory." This and all the chapters that follow are attempts to capture the fluidity of geohistorical development in this constantly changing urban landscape through multiple layers of interpretation and reinterpretation. At least three pronounced "inversions" took place in the four decades following the Watts Riots, each contributing to the city's remarkable metamorphosis. By inversion I mean a major historical reversal in which the LA that existed in the first three-quarters of the twentieth century was turned upside down and inside out. A new Los Angeles was created that in many ways was opposite to the image of Los Angeles that had developed in the academic literature and popular media up to the 1970s and which, despite its outdatedness, continues to dominate many present-day views of Los Angeles as well. One of the first tasks in looking at Los Angeles is to challenge this persistent inheritance of increasingly anachronistic imagery. The first of these dramatic inversions had to do with the local labor movement. Once the realm of "sunshine and the open shop," to use Mike Davis's felicitous phrase, the old Los Angeles was renowned for its probusiness, antilabor environment. It stood out as a retrogressive counterfoil to New York City and its ultraliberal western outlier, San Francisco. LA had its moments-a significant flirtation with socialism if not anarchism in the 1910s, a breeding ground for revolutionary movements in Mexico and China, the groundbreaking center for the first wave of federally sponsored public housing in the early 1950s-but the dominance of institutions such as the chamber of commerce, the local manufacturers' association, and the then ultraconservative LA Times was clearly established and quite capable of breaking the back of any left-of-center trend or militant labor union activity. The red-baiting war against public housing and the Hollywood blacklisting that arose from the inquisitions of the House Un-American Activities Committee in the 1950s confirmed and consolidated this dominance. Twenty years later, however, Los Angeles began its unexpected emergence as a leading generative and innovative center of the national labor movement, especially with regard to gender equality, gay rights, and above all, the organization of immigrants.1 Nowhere in metropolitan America have labor unions grown in membership and local power as they have in LA, and nowhere else have immigrants played as central a role in the labor movement. I will return to these remarkable developments in labor-community coalition building from the Watts Riots to the present in chapter 8. A similar role reversal and image inversion took place with regard to neighborhood identities, place-based politics, and the activities of community-based organizations. For most of the past century, Los Angeles has been seen as the epitome of automobile-based urbanism, with residents creating far-flung "autopian" networks of contacts and attractions rather than forming "proximate communities"-well-defined neighborhoods where pedestrian life flourished and everyone knew and relied upon their neighbors. Berkeley urban planning professor Melvin Webber famously described LA in the 1970s as a "non-place urban realm," where distances were elastic and the local meant little, where many households had unlisted phone numbers and nestled behind high walls and a sign or two reading "Trespassers Will Be Shot. "2 Since 1985, for many different reasons, just the opposite has been happening to community identity and activism. Perhaps nowhere else in the country today are neighborhood, community, and other place-based organizations as numerous, active, and successful, a topic that will also be explored further in chapter 8. A third material and reputational inversion has transformed Los Angeles from the least dense and most destructively sprawling major metropolis in America-literally and figuratively seventy-two suburbs in search of a city-into the country's densest urbanized area, surpassing the twenty-three-county New York City urbanized area in 1990 and widening its lead ever since. Several factors contributed to this stunning reversal. One of the largest city-focused migrations in world history (at least BC, before China) added almost five million people (almost all from developing countries) to the population of the inner urban core alone. In all, since 1975, nearly eight million were added to the five-county LA urban region, by far the largest growth spurt among cities in the developed world outside Japan and comparable to the expansion of the great Third World megacities, such as Lagos, Dhaka, and Mexico City. Also contributing to its overall density has been an extensive urbanization of LA's suburbs. For most of the twentieth century, Los Angeles was seen as the model for the sprawling suburbanizing western cities of North America. Today it is the prototype of what I have called regional urbanization, a new mode of urban growth defined primarily by the densification, if not full-scale urbanization, of suburbia and the replacement of the domestic population in the urban core with large numbers of Third World immigrants. I will discuss what I see as an epochal shift from metropolitan to regional urbanization in LA in later chapters. Mentioning it here serves to reinforce and exemplify further the argument that the Los Angeles city region has changed more substantially since 1975 than almost any other in the world. Its iconic suburbia of the past is fast disappearing, the "seaport of Iowa" is now being called the "capital of the Third World," what were once minorities are now in the majority, and the ultimate WASP city is now predominantly Catholic and Evangelical. Beyond all doubt, Los Angeles is no longer what it used to be. It remains an exemplar of many contemporary urban trends, but these trends are very different from those exemplified by Los Angeles in the first three-quarters of the twentieth century. To cling to these earlier images can lead only to misunderstanding. Although it was nearly impossible to tell where LA was going in the 1970s, things were undoubtedly changing very quickly. It soon became abundantly clear to the growing cluster of urban researchers trying to make theoretical and practical sense of what was happening in this period that Los Angeles was moving in directions that differed greatly from other major cities in the United States and that these differing paths demanded new ways of thinking about urban development and change. As the material landscape of LA changed dramatically, so too did the methods and means of studying it, to a degree that was just not as pronounced in New York or Chicago or even Atlanta, Miami, or Houston, at least until very recently. Making theoretical and practical sense of the social and, more emphatically, the spatial patterns of urban restructuring in Los Angeles became the research focus for a group of critical scholars, led primarily at first by urban and regional planners and geographers at UCLA. The first challenge faced by this emerging research cluster was to make their voices heard over the highly influential interpretations of urban change that had emerged among urban analysts and policy makers east of the Mississippi. The eastern academic and political establishment had already quite confidently assumed they had the answer to what was happening after the end of the postwar boom. To begin with, the United States was experiencing a kind of role reversal in regions and regional development, a "power shift" between the Frostbelt-the heartland of American industrialization, stretching roughly from Saint Louis to New York City-and the Sunbelt, led by the "New South" from Texas to Florida, with a sunny outlier on the Pacific Rim. Enhancing this interpretation were census statistics for 1970 and 1980, which seemed to indicate, especially through the overall decline in manufacturing employment, the beginning of a postindustrial era, with America the affluent at the forefront of an emerging new kind of capitalism. In this emerging postindustrial society, it seemed that manufacturing no longer mattered, as jobs and the economy as a whole shifted into various tertiary or service activities, from burger flipping to high finance. The resulting deindustrialization of America, as it was called, was painful for many, including nearly all the once thriving communities in the American Manufacturing Belt, as well as African Americans and other members of the new "urban underclass," who were seen as being left stranded in the decaying cores of nearly all Frostbelt cities.3 Also suffering were the big industrial unions and the unionized workers that had benefited so fulsomely from the postwar boom. Economic restructuring-defined almost entirely as deindustrialization-was destructive but necessary, the theoreticians and policy makers claimed. It was deemed an essential part of any recovery from the widespread urban upheavals of the 1960s and the global economic downturn of 1973-74. To researchers working in and on Los Angeles, this seemed a rather misleading if not wholly inaccurate picture of what was happening. Almost unknown to the eastern establishment, LA had for decades been the country's largest industrial metropolis. To call LA postindustrial seemed absurd, especially since the manufacturing sector had been booming in the 1970s. Relatively few of the nearly one million African Americans in LA were "stranded" far from suburbanizing jobs through some "spatial mismatch." In this mixed urban-suburban landscape, jobs were relatively close by, although racial barriers made these nearby jobs difficult to obtain. Furthermore, unemployment and welfare dependency were not big issues, as the huge Hispanic immigrant population held multiple jobs, forming what was better called an agglomeration of the working poorratherthan a welfare-dependent underclass. Even the term Hispanic was locally disdained in favor of the ambitiously inclusive new term Latino, referring expectantly to everyone coming from south of the U.S. border. More than a third of Los Angeles's population, the working poor were unable to bring in enough income to rise above official poverty levels despite holding multiple jobs per household. They certainly were not dependent on public welfare, although many claims arose and many studies were conducted as to whether the working poor contributed more than they took from the local economy. Most studies showed they added much more than the welfare they received, although anti-immigrant elements within the Anglo (non-Hispanic white) population continued to demand more discrimination against the working poor, such as denying resident noncitizens the right to public school education. Similar problems were growing in other major metropolitan areas, but they were contextualized and interpreted very differently than they were in Los Angeles, given the ethnic cleansing or bleaching (into Anglo or non-Hispanic white) that Spanish-speaking Californio LA experienced after the U.S.-Mexico War. Exploding the myths of postindustrialism further encouraged the LA researchers. After an initial period when the new writings from Los Angeles were dismissed as marginal quirkiness or irrelevant banter, there emerged a national and indeed worldwide expansion of interest in what was happening in Los Angeles, especially with regard to what became known as industrial restructuring and the related formation of a new post-Fordist metropolitan economy and geography. What was coming to an end was not urban industrial capitalism but a phase in its development that came to be described as Fordism, a phase that began in the interwar years, helped the United States and other countries out of the Great Depression, and led the way to the boom years following the Second World War. One of the main sparks for all this attention to LA was the publication in 1983 of "Urban Restructuring: An Analysis of Social and Spatial Change in Los Angeles," which I coauthored with Rebecca Morales and Goetz Wolff (app. 1, source 1A). Morales, one of the early graduates from the urban planning program at UCLA and then a member of the urban planning faculty was at the time engaged in research focusing on the uses of immigrant labor in the economic restructuring process, especially in the automobile industry.5 This early research is the source of an anecdote that vividly sets the scene for our analysis and understanding of what was happening in Los Angeles in the early 1980s. Nose and mouth covered against possibly poisonous dust, Morales entered the back room of a small factory in South LA that produced, if I remember correctly, car hubcaps. As she wandered among the immigrant workers, she saw a pile of the final product against the wall. Getting closer, she saw the last step in the production process: stamping each hubcap with the words MADE IN BRAZIL. What in the world was going on? Was this just a minor scam, or did it represent a more widespread phenomenon associated with the emerging New Economy and the particular form it was taking in immigrant-filled Los Angeles? It suggested that wages were so low and immigrant labor so abundant that LA-based manufacturing could, with some transport savings and other conditions, compete with Third World producers-as long as the unions and policy makers did not interfere. Joining Rebecca Morales and me in this initial venture into the urban restructuring process and what could be called the changing political economy of urbanizationwas Goetz Wolff, then a doctoral student with a degree in political science from Yale and a deep interest in labor issues. He had coauthored a widely cited article on "the world city hypothesis" with the senior planner John Friedmann. Soon after 1983, Goetz would leave graduate school to create his own labor-oriented consulting firm and later become a key figure in the labor movement in Los Angeles, as well as a lecturer and "practitioner faculty" in the UCLA Urban Planning Department. Together, we were working to introduce a significant labor component into urban planning education, a third force, so to speak, beyond but equal to the public and private sectors. My LA studies began as part of my transition from teaching in the Geography Department at Northwestern University to working with much more activist and "applied" graduate students in urban planning at UCLA.6 The immediate trigger, however, was an inquiry from the Coalition to Stop Plant Closings, a new alliance organized to fight deindustrialization and the closure of once prosperous factories, mainly producing automobiles, tires, glass, steel, and many consumer durables-what scholars at the time would label the products of "Fordist industries." While overall job growth was expanding, Los Angeles in the 1970s and early 1980s was also experiencing a significant loss of Fordist manufacturing jobs, primarily in several older heavy industrial zones, such as the area stretching south of downtown to the port of Los Angeles-Long Beach, then and now the second largest city in the urbanized region. Although the economic geography was poorly understood in 1980, and visions of "industrial Los Angeles" were dominated by Hollywood filmmakers leading what was locally called "the" industry, Los Angeles already hosted the largest concentration of manufacturing employment in the United States. Unusually large areas were zoned for industrial use, and specialized municipalities had formed, such as the bluntly named City of Industry and City of Commerce. While Los Angeles certainly could not be labeled postindustrial, it did experience a significant deindustrialization after the recession of the early 1970s. We estimated that at least seventy-five thousand jobs were lost because of factory closures and job layoffs. This was not surprising, given that LA contained the largest assemblage of vulnerable Fordist industries west of the Mississippi. Significantly, this allowed those studying Los Angeles to investigate the causes and consequences of both Frostbelt deindustrialization and the new industrial expansion of the Sunbelt, which we in Los Angeles called reindustrialization. There were very few if any metropolises in the world where one could see and study this dynamic interaction between deindustrialization and reindustrialization more clearly than in Los Angeles. Even with substantial reindustrialization, industrial labor unions and once thriving blue-collar communities were being decimated as rapidly in LA as anywhere else in the country. Factory closures and job losses focused on Fordist industries and the neighborhoods where they were located, while in many other areas around sprawling Los Angeles new kinds of post-Fordist and information-based industries created rings of much wealthier suburban municipalities. It was as if the Sunbelt and Frostbelt had become oddly mixed together in one place. Under siege and utterly confused by the contradictory boom-bust trends they saw around them, and receiving no relevant help from once powerful national union offices, union locals in Los Angeles, building on the precedent set by the United Farm Workers years earlier, began to create new labor-community coalitions, often with the help of scholar-activists from local universities. This early growth of labor-community unionism and coalition building led to the creation of the Coalition to Stop Plant Closings (CSPC) and its efforts to stem the tide of deindustrialization. One of the first major test cases for the coalition was the threatened closure of a General Electric flatiron plant in Uplands, San Bernardino County. Concerned about how to organize workers at the factory to oppose the closure, especially when workers were being told that they should not worry about closure given the job boom LA was experiencing, the United Electrical Workers union local turned for help via the CSPC to the new group of local university researchers studying Los Angeles. The project stimulated by the CSPC became the springboard for a major stream of empirical research, theory building, and planning practice that would swell, over the next three decades, to a level probably unsurpassed in any other city. It would also move well beyond the Geography and Urban Planning Departments at UCLA to other universities and disciplines. The explosion of LA-based research and writing took place after three-quarters of a century in which the solid academic literature on Los Angeles barely filled a bookshelf. While the CSPC would fail in its bold effort to control footloose capital during a time of rapid economic and technological change, it would become the political and experiential seedbed for extraordinary developments over the next thirty years that would make Los Angeles an innovative center for labor-community-university coalition building not just in the United States but in the world. In essence, the Coalition to Stop Plant Closings asked us to help them understand what was happening to Los Angeles in the late 1970s and early 1980s. The request was specifically connected to the United Electrical Workers union, which was facing the possibility of a shutdown of the GE plant in Uplands. "How can we organize on the shop floor to fight against this threatened closure," they asked us, "when, contrary to what was happening back east in the American Manufacturing Belt, jobs seem to be increasingly plentiful in LA?" The workers were saying, "Why bother protesting? We can easily get new jobs." Little did they know that they might have to get two or three jobs to make the same money they were earning in Uplands. We then set to work on a two-level project. Our first product was a pamphlet that described early warning signs of plant closure that we hoped could be used to mobilize support at the factory. Illustrated by a union cartoonist, the pamphlet was published in 1980. A sampling from the pamphlet is presented here (figures 1a-e); the entire pamphlet can be read online at www.ucpress.edu/go/myLA. With painful irony, the pamphlet appeared on the day it was announced that the GE plant was closing. The pamphlet was a tiny primer on economic restructuring, although more elaborate answers to the questions raised about factory closures and footloose capital in Los Angeles were contained in our article, "Urban Restructuring." In our broader explanation, we saw capital-in the form of businesses and corporations-responding to the downturn that was clearly evident by the time of the worldwide economic recession in 1973-74. For the national economy, the postwar boom was over, business as usual could no longer be depended on to be profitable and expansionary, and new ideas and new directions were necessary to restore anything like boom conditions. Thus began a period of experimentation, seeking innovations in technology, labor-management relations, and corporate organization in an effort (not always successful) to stimulate renewed economic expansion and improved forms of social control over destabilizing unrest. For the majority of businesses, however, there was a seemingly easier way, at least in the short run, to increase profits: cut costs. And the easiest cost to cut was labor. Crisis-generated restructuring and the dilemmas faced by the electricians union in Uplands were triggered and driven initially by various methods of cutting labor costs. Firing or laying off workers and closing down factories, especially in the Fordist industrial sector, which had led the postwar boom but was now experiencing the worst economic decline, seemed the easiest method. Throughout the 1970s and into the 1980s, the major industrialized regions of the world, from New England and the American Manufacturing Belt to lowland Scotland, south Wales, northeast England, Wallonia in Belgium, and the Basque country in Spain, experienced varying degrees of deindustrialization, with the greatest devastation associated with weaker national labor unions and deficient state welfare policies.8 Continental Europe saw lower levels of deindustrialization, Great Britain somewhat more, and the United States the most. Even in the United States, such cost cutting was not always easy. The American postwar boom, which was one of the most dramatic and successful in the history of capitalism, especially in Los Angeles, had created the world's largest suburbanized middle class, as unionized workers received huge benefits, ranging from health provision to housing subsidies, in large part by agreeing through collective bargaining to forgo full-scale strikes or not to interrupt production and to increase productivity in other ways in return for increasing wages and benefits. This involved what some called a "social contract" among big labor, big government, and big corporations. Firing workers and closing factories without explanation were within the rights of corporate management in the United States (if inconceivable in, say, Scandinavia), but strong industrial labor unions would make such tactics very difficult. Deindustrialization expanded at a fast pace through several U-turns in the public and private sectors. Union busting became more acceptable than ever before, as signaled by President Reagan's treatment of the air traffic controllers in the early years of his regime and Margaret Thatcher's similar stance with regard to British miners' unions. To enhance the acceptability of such efforts to the voting public, an extraordinary ideological shift was necessary. The majority of voters had to be convinced that a) the economic problems were caused by big government in cahoots with big labor unions, with workers selfishly gorging themselves on social welfare; b) the social contract and its allied policies, from the New Deal to the War on Poverty, had to be dismantled in response to economic decline; and c) the magic of free enterprise markets was a sufficient substitute for what was being lost. In the churning propaganda mills that rationalized, or "spin-doctored," the restructuring process, neoliberalism was born-and would persist as an ideological smokescreen up to the present day. Around the country, there was little that could be done to stop increasingly unregulated and footloose capital from moving to new locations (including overseas) in their search for labor savings. Plant closings did not go forward, however, without some resistance in Los Angeles. While not always successful, the Los Angeles Coalition Against Plant Shutdowns (LACAPS), the new name adopted by the Coalition to Stop Plant Closings, pressured state and local government agencies to create or increase the level of special services for displaced workers and introduced state legislation requiring advance notice of plant closings and compensation to displaced workers and affected local communities. LACAPS's efforts, both locally and nationally, even when unsuccessful, planted the seeds that would grow into the resurgence of labor-community coalition building in LA ten years later. The 1983 article was one of the first published works to specifically focus on urban restructuring. It also signaled several key characteristics of the research cluster (or "school," if one prefers) that would develop in the 1980s. Particularly important was the use of Los Angeles as a laboratory for developing a more general understanding of contemporary urbanization processes around the world. Less attention was given to the unique and particular qualities of the local scene than to how one might better understand what was happening in other cities from studying Los Angeles. Emphasizing the socio-spatial patterns of change reflected the strong geographical or spatial perspective that was as the heart of the research cluster. What we saw in Los Angeles was a contemporary form of what Marx called "capitalist centralization"-the beginnings of what would become an extraordinary polarization of wealth, which was an integral part of the crisis-generated restructuring process. Centralization, in Marxist terms, refers to a coming together of different fragments of capital, as in the formation of corporate monopolies in the late nineteenth century or other forms of intercorporate cooperation and amalgamation, such as the formation of large corporate conglomerates. As will be discussed further in chapter 5, many different forces combined to concentrate wealth in fewer hands, creating over the past forty years a greater gap between rich and poor in the United States-with the largest gap found in Los Angeles and New York-than at any other time in its history. Glimmers of this process of concentration and polarization were already evident in LA in the 1970s. Confident in the exemplariness of Los Angeles, our first working assumption was that urban restructuring did not arise out of thin air but was generated by the series of urban, national, and international crises that marked the 1960s and early 1970s. This made the Watts Riots a significant turning point and explains why we insisted that the term restructuring needs to be preceded by crisis-generated, lest these origins be forgotten. As urban studies at the time said little about cities in crisis, preferring tendencies toward peaceful equilibrium, Marxism, in the form of the new urban political economy that forcefully emerged in 1973 with the publication of David Harvey's Social Justice and the City, became the logical starting point for understanding crisis-generated urban restructuring. The first sentence in the text announced one of our most important early discoveries-that the five-county built-up area of LA was one of the world's largest industrial metropolises. Moreover, during the 1970s LA had been experiencing a concentration of industrial production, employment growth, and international corporate finance that was probably unmatched in any other city in the advanced industrial countries (and would never be surpassed in LA in any subsequent decade). "Look at Los Angeles," we virtually shouted to the world. "Everyone needs to take notice of its remarkable metamorphosis to understand the contemporary urban condition, wherever one resides." We backed up our claims with empirical data. According to U.S. Census Bureau Annual Survey of Manufactures statistics, between 1970 and 1980, when the entire United States had a net addition of less than a million manufacturing jobs, the Los Angeles region added 225,800. In comparison, New York City lost 330,000 jobs, and Detroit, LA's major industrial rival in the previous four decades, lost even more.11 More astonishing, in the same decade, the total population of the LA region grew by 1,300,000, while the number of nonagricultural wage and salary workers increased by 1,315,000. There seems little doubt that Los Angeles during the 1970s was the developed world's most generative job machine, even if the majority of the jobs were not well paid. We were also quick to point out that this economic boom was not spreading joy and prosperity everywhere. Accompanying the boom (and in part causing it) were extensive job layoffs and plant closures, deepening poverty and unemployment, the appearance of industrial sweatshops reminiscent of Dickensian London, the intensification of ethnic and racial segregation, and increasing rates of urban violence and homelessness. In this juxtaposition of substantial aggregate economic growth with widespread indications of recession and decline, the Los Angeles region appeared to be combining the contrasting dynamics of both Sunbelt and Frostbelt cities, adding to this mix some of the features associated with Third World export-processing zones. We described Los Angeles as a "peculiar composite metropolis," an "articulated assemblage" of many different patterns of contemporary urbanization-a Houston, a Detroit, a Lower Manhattan, a Singapore, and a São Paulo rolled into one. This depiction illustrated the title of the chapter in my Postmodern Geographies (1989) that presented a revised version of source 1A: "It All Comes Together in Los Angeles" (app. 1, source 1B), a phrase adapted from what was then the banner of the local newspaper ("It All Comes Together in the Times").12 This composite picture of urban restructuring opened up many new directions to investigate. Underlying it all, however, was a view of Los Angeles as a revealing site and situation for understanding the changing political economy of contemporary urbanism everywhere. Many different terms were used to capture this revealing quality without suggesting that every city would follow the LA model. LA was described as representative, indicative, exemplary, symptomatic, paradigmatic. The findings of our empirical analyses of urban restructuring in Los Angeles can be summarized in a series of maps that originally appeared in sources 1A and 1B (app. 1). Many of these maps were the first of their kind and called for similar mappings in other urban regions. During the 1970s, the aerospace/electronics cluster of industries grew by 50 percent, with 110,000 jobs added, making it the core manufacturing sector of the LA region and creating one of the largest such concentrations in the world. This "high-tech" sector combined civilian and military-related production, which had become difficult to separate given their shared dependence upon technology arising out of Department of Defense and NASA research and development activities and a heavy reliance on military and defense contracts. Geographically, what could be called a new Silicon Valley developed in Orange County, with smaller clusters in the area around Los Angeles International Airport and in the West San Fernando Valley (see map 5). Associated with these developments was a marked reduction in unionization rates. Following national trends, California workers in unions declined from 30.9 percent in 1971 to 23.5 percent in 1979, percentages very close to those for LA County. The change in industrialized Orange County, however, was even more pronounced, dropping nearly ten percentage points over the same period, to 13.8 percent. In Orange County manufacturing, there was almost total collapse, with the unionized workforce moving from 26.4 to 10.5 percent, representing an absolute decline of over one-quarter of the union membership in 1971. The polarized geography of social class in LA is represented in map 7. The almost complete absence of touching or overlap between blue-collar and executive-managerial residential areas is quite stunning and indicative of the unusually high degree of class polarization. Note also the size of the blue-collar concentration in Long Beach, the region's "second city." Comparing maps 6 and 7 is also quite revealing. The predominantly blue-collar urban core is almost entirely African American and Latino, while the Anglo managers and executives live on the slopes of the Santa Monica and San Gabriel Mountains or on the Palos Verdes Peninsula, far from the teeming center. Urban restructuring in Los Angeles has been closely associated with an enormous influx of immigrants, primarily from countries along the Pacific Rim. The magnitude and diversity of immigration since the Immigration and Nationality Act of 1965 can be compared only with the wave of European migrants to New York City in the late nineteenth and early twentieth centuries. In 1960, Los Angeles County was over 85 percent Anglo. By 1980, Latinos, Blacks, and Asians together accounted for over 50 percent of the population, with the Latino segment growing into the majority in the 1990s (see map 8). Greatly underestimated in the ethnic map of Los Angeles is the large "undocumented" or "illegal" immigrant population, estimated at somewhere between 400,000 and 1.1 million in 1980. Mexicans made up the largest portion of this group, but there were representatives from almost every country in the world. Together with the majority of the new "legal" immigrants, the "undocumented" population provided the Los Angeles economy with perhaps the largest pool of cheap, manipulable, and easily dischargeable labor of any advanced capitalist city during this boom period. This pool of immigrants, documented or otherwise, were thought to be unorganizable by traditional labor unions in 1980, but by the 1990s they had become the primary force behind the growth of Los Angeles as an innovative center of the national labor movement. Immigrant labor formed a key part of the restructuring process in Los Angeles, affecting virtually all sectors of the regional economy. Undocumented workers, in particular, were concentrated in small, highly competitive firms in garment and other forms of light manufacturing, including electronics, as well as in hotel, office, and restaurant services. These firms, either too small or too fixed in location to move abroad, typically depend on low-skilled, often transient laborers who can be paid extremely low wages, especially in comparison with unionized blue-collar workers. In the years between 1965 and 1980, Los Angeles drew ahead of San Francisco and consolidated its position as the financial hub of the western United States and the primary gateway to the Pacific Basin. A reflection of this concentration of the FIRE sector (finance, insurance, real estate) appears in map 9. As one might expect, this financial expansion was accompanied by a major office-building boom, with over thirty million square feet of high-rise office space added between 1972 and 1982, representing more than a 50 percent increase. With these developments, downtown Los Angeles became the anchor of a control-headquarters complex that stretched westward along Wilshire Boulevard almost twenty miles to the Pacific in Santa Monica. This extended "linear" downtown contained such major nodes as Beverly Hills, Century City, and Westwood. In this almost unbroken ribbon of office development were nearly fifty major corporate headquarters and an additional one-third of the region's hundred million square feet of high-rise office space. Downtown Los Angeles was intensely globalized during this period, with Japanese, Canadian, and British capital playing important roles in a skyscraper boom that peaked in the late 1980s. By 1990, the FIRE boom-and so much else-began to decline significantly, as many corporations and banks closed their headquarters in Los Angeles. This economic turnaround would reach a boiling point in the 1992 riots, which exposed the occasionally excessive claims about Los Angeles's relative positioning among the world's major global cities that characterized the first round of writings about the urban restructuring in Los Angeles. What are now called the Justice Riots of 1992 destroyed much of the optimism of the early LA research cluster and stimulated several efforts at reinterpretation, utilizing different ways of looking at urban restructuring. Seeing urban restructuring as an attempted spatial fix can be better understood with reference to a series of related ideas formulated by Harvey. He argued that the social process of capitalist development shaped urban geography and the built environment to fit its needs at a particular moment. But as the needs of capitalist development change over time, becoming especially challenged during periods of crisis, the existing geography and built environment become, to an increasing extent, outdated and dysfunctional, a straitjacket of sorts. A new and different geography is required to meet the changed needs of capital (for instance, the New Economy).15 But there is a certain fixity to the urban geography. Unlike most institutional structures and unconcretized social relations, one cannot just change the built environment and well-established geographies at will. For example, the Empire State Building may have been perfectly located when it was built in the 1930s, but by the 1960s it would probably have been more profitable if located somewhere else. But the building cannot simply be picked up and relocated. This dilemma triggers complex reactions, some "stakeholders" wanting to maintain the status quo, others calling for major repair and reconstruction, still others wanting to tear down the building entirely and rebuild something else on the site. This competition over city-space and the built environment is reminiscent of the dilemmas of urban renewal in many U.S. cities, where many different stakeholders had often conflicting plans of what should be done with the city center, typically leading to the poor suffering the most, with urban renewal not so jokingly becoming urban removal of the poor. Competition and conflicting strategies are built into the attempted spatial fix. So too is what the economist Joseph Schumpeter called "creative destruction." Whereas the new geography of Los Angeles can be said to reflect the needs of the New Economy, the fit and the fix are far from perfect. Not only is capitalism not the only force shaping the new geography, but even its influence is not predestined to be successful. While it is important to recognize that urban restructuring is associated with an attempted spatial fix, there is no reason to assume the fix will effectively bring the crisis to an end. As noted, there are many other forces shaping-and being shaped by-urban and regional geographies. For example, race and ethnicity powerfully influence the "spatiality" of urban life, as do gender and sexual preference. Ever since the nineteenth-century emergence of the distinctively industrial capitalist city, however, the needs of capital in conjunction with the largely supportive role of the state have almost surely been the most powerful force shaping urban geographies and guiding the processes of crisis-generated restructuring. Hence the emphasis on capital, labor, and their relations in this first round of studying the political economy of urban restructuring. During the same period, the highly centralized and decidedly competitive industrial capitalist city, due probably in large part to urban unrest in and around the city centers, began to sprout suburbs as well as satellite cities, such as Gary near Chicago, East Saint Louis close by Saint Louis, and Wayne and other automobile satellites surrounding Detroit. This was the beginning of the metropolitan form of urbanization and what can be called the Metropolis Era. The modern metropolis would boom in the early decades of the twentieth century, much of which was called the Progressive Era in the United States, only to crash in 1929 and further decline during the Great Depression of the 1930s. The 1930s, capped by the human and environmental destruction of the world war, was another period of economic restructuring, creative destruction, and purposeful spatial reorganization. Two names defined the emergent New Economy that would survive depression and war. Fordism, named after the innovative car maker, defined the turn toward assembly-line mass production and automobile-led mass suburbanization and consumerism. Suburbanization and the metropolitan form were also vital parts of Keynesianism, named after the famous British economist whose ideas about crisis management, demand-driven development, and the role of state-provided social welfare in not only driving a profitable and booming economy but also maintaining social control and keeping the peace were equally important in recovery from economic depression and preparation for a costly war. The third period of economic restructuring and changing urban geographies brings us back to Los Angeles and the focus of this first chapter. Looking back, Los Angeles's geography has evolved through three periods of restructuring. As it began its major growth spurt in the last decades of the nineteenth century, it did not experience much of the dense centralization of the early industrial capitalist city, so vividly modeled by the Chicago School.18 Although founded in 1781, the city of Los Angeles remained a small peripheral outpost until a century later, when the urbanization process had become more decentralized, extensive residential suburbanization had begun, and clusters of separately incorporated municipalities started to rim the central metropolitan city. Between 1880 and 1920, the population of Los Angeles grew rapidly from thirty-five thousand to nearly a million inhabitants, but this growth was shaped by the social and spatial relations of the "metropolitan" mode of urbanization rather than that of the earlier centralized industrial capitalist city. As industrialization advanced in the twentieth century, downtown LA did become the largest industrial concentration, but from the start urban industrial growth was polycentric and dispersed in a wider metropolitan network of settlements that seemed to combine urban and suburban characteristics. Los Angeles's greatest growth spurt, however, occurred between 1920 and 1970, the leading period of what can be called the era of the modern metropolis. The prevailing pattern of residential and industrial location in LA was thus already polynucleated and decentralized, with relatively low overall densities, by 1920, when the city reached one million inhabitants. While the tiny downtown was gridlocked with automobile traffic, the whole region was enmeshed in one of the most extensive and busiest public transit networks of any city, the Pacific red car system. Even with aggressive annexation policies that increased the size of the City of Los Angeles from 85 to 362 square miles in the decade 1910-20, the population of the incorporated areas of the county grew more rapidly than the administrative city itself. From 1920 to 1940, covering the years of the Great Depression, Los Angeles County added nearly two million inhabitants, roughly evenly divided between city and suburbs. Petroleum refining and the aircraft industry were solidly established, and during the depression four major auto manufacturers opened assembly plants, attracting rubber tire and other auto-related Fordist industries to the area. Los Angeles remained, however, an economic center of relatively small firms engaged in food processing, garment manufacturing, furniture production, tourism, and motion pictures. Despite a history of vigorous workers' struggles, Los Angeles also remained a preeminent center of effective labor control, an area where the open shop was virtually a law in the fifty years following the 1890s depression. Few cities in the country faced more powerful and organized antilabor organizations than LA. Los Angeles and Detroit presented exemplary representations of the new metropolitan model of urban industrialization, but while Detroit was absorbed into the dynamics of the American Manufacturing Belt, Los Angeles became the widely accepted prototype of the new Western cities: sprawling, low-density, decentralized, seemingly (at least from an eastern viewpoint) almost entirely suburban, not really like cities east of the Mississippi or in Western Europe. LA suffered relatively little from the Great Depression and, given the sequence of Pacific wars from 1941 through Korea and Vietnam, boomed to an extraordinary degree as "America's arsenal," with its "state-managed" economy pumped up with billions of demand-driving Defense Department dollars. During the Korean War period, 1950-53, total employment reportedly increased by 415,000 jobs, 95,000 in the aircraft industry (by then reoriented from an emphasis on aircraft frames to a more diversified aerospace-electronics-guided missile manufacturing). By the early 1960s, the City of Los Angeles contained two and a half million people, while Los Angeles County's population reached over six million, more than doubling its size since 1940. Rapid growth would continue at least until the 1990s, making Los Angeles one of the few First World cities to grow significantly in population over the past forty years. As the City of Los Angeles reached a population of more than four million and the entire city region grew to around eighteen million today, the urban geography changed in dramatically new ways, creating a very different urban condition that demanded new methods and modes of analysis and interpretation. At once informative and entertaining, inspiring and challenging, My Los Angeles provides a deep understanding of urban development and change over the past forty years in Los Angeles and other city regions of the world. Once the least dense American metropolis, Los Angeles is now the country’s densest urbanized area and one of the most culturally heterogeneous cities in the world. Soja takes us through this urban metamorphosis, analyzing urban restructuring, deindustrialization and reindustrialization, the globalization of capital and labor, and the formation of an information-intensive New Economy. 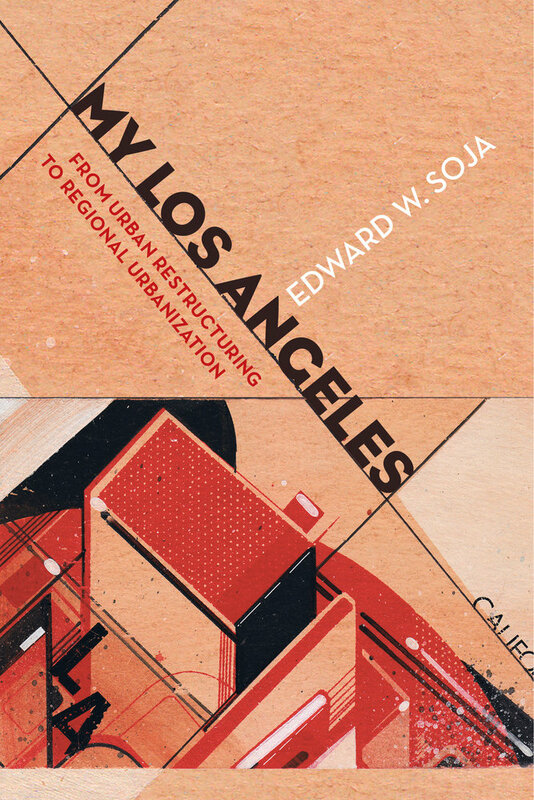 By examining his own evolving interpretations of Los Angeles and the debates on the so-called Los Angeles School of urban studies, Soja argues that a radical shift is taking place in the nature of the urbanization process, from the familiar metropolitan model to regional urbanization. By looking at such concepts as new regionalism, the spatial turn, the end of the metropolis era, the urbanization of suburbia, the global spread of industrial urbanism, and the transformative urban-industrialization of China, Soja offers a unique and remarkable perspective on critical urban and regional studies. Edward W. Soja is Distinguished Professor Emeritus of Urban Planning at University of California, Los Angeles. He is the author of Postmetropolis: Critical Studies of Cities and Regions and the co-editor of The City: Los Angeles and Urban Theory at the End of the Twentieth Century among other books.